Too many emails come my way asking for money towards some human right. Don’t get me wrong: I love human rights. I believe that humans have rights, and that they are wonderful and worth protecting. I just don’t think that cable television counts. Okay just kidding on that last one. I typically (and subconsciously) draw the line on a human right at anything a wealthy friend of mine does not have and yet thrives without anyway. But recently I’ve come to terms with how pathetic that definition is. Americans have the Bill of Rights; the French have the Declaration of the Rights of Man; the Brits have the Magna Carta – the thorn in the side of many a monarch. 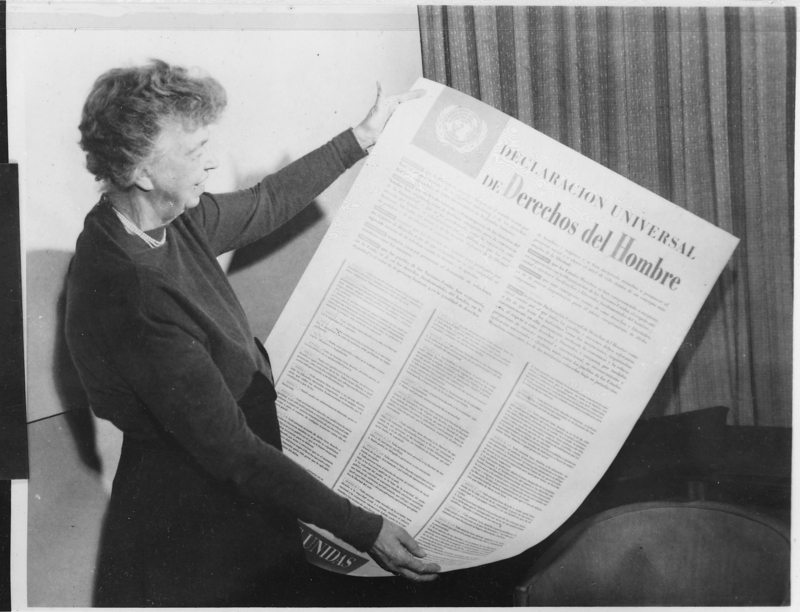 The Universal Declaration of Human Rights outlines a long list of rights, including the right to own property, marry and not be tortured. The UN adopted it in 1948 in response to the atrocities of WWII. Some parts sound like cut-and-pasted excerpts from the United States’ Bill of Rights – and parts of it don’t: social security, for example; and compulsory, free elementary education. What do you think makes something a human right? Do you think we misuse the term today? Perhaps more importantly, what is our obligation in protecting a human right? I’m really interested in your answers. I’d like to feel more confident in my own definition moving forward. Thanks for your help! Human rights are an evolving quantity. There are no “rights” naturally imbued in individuals rather societies determine that it will always respect or treat its members according to some basic rule. Which rights are afforded speaks to the wealth and sophistication of the society. It is healthy to debate as a society becomes wealthier and more sophisticated if the number of rights should increase and how so. Healthcare for all would have sounded absurd at the founding of America, but now this nation is exceptionally wealthy and could afford such costs even for its poorest members if we wished to share the burden. When America adopted the right of equal protection under the law, we were one of the first nations to do so. It is a very expensive right: vastly slowing the acquisition of justice, increasing the cost and complexity of the justice system, and occasionally letting bad guys off the hook for the sake of protecting their rights. We all recognize today that equal protection is a fundamental right that we all expect to receive if we were ever accused of a crime. But 200 years ago it was under heavy debate as a “right.” Education, healthcare, cellphones, internet, etc. are all potential future human rights, because as a society we may deem them so important that providing them for all improves society despite the obvious costs required of each. It is healthy to debate which “rights” satisfy the condition of improving society. I must take issue with some of the points made in the previous comment. “Human rights are an evolving quantity.” No they are not, they are fixed and governments pervert them continually to gain and to keep power. “There are no “rights” naturally imbued in individuals…” No that is not correct either and upon this concept rests the entire American system of government.I quote from Jefferson’s Declaration of Independence: “We hold these truths to be self evident, that all men are created equal, that they are endowed by their creator with certain unalienable rights..” That statement means that America was founded upon a belief that rights come from God and government cannot legally take them just as government does not bestow them. The declaration goes on to explain that governments only purpose is to secure those rights and for that purpose governments are instituted. Equal protection under the law has been a a concept in Western Jurisprudence since the adoption of the Magna Carta in 1215. We had to learn over time that God made us all, not just some of us. We do recognize today that equal protection is fundemental and that is why we had better start holding government to that standard if we want to remain free because those in government, especially the executive branch have started of late to take the position that the law applies to us but not to them. Finally, theft is theft whether by stroke of pen or at gun point. Government may steal my labor for its own purposes but not legally. Ditto, listen to your father, a very wise man! I’ve always thought of human rights as interchangeable with natural rights (which could be wrong, I’m no philosopher), and I’m persuaded by Locke/Hobbes: they are life, liberty, and property. I do think Westerners misuse the term, in the sense that we expand human rights to include whatever we’re feeling sorry for someone not having at the moment. Not that I don’t want everyone in the world to have internet access, but I think this distracts us from the reality that many, many people in our world still have their right to life, liberty, and/or property curtailed. What is our obligation? Well I think protecting natural rights is the primary purpose of any government or any social contract, and so by extension I guess it should be the primary concern of any free society. I think there’s so much entitlement floating around that it gets confused with human rights. Human rights are closely intertwined with dignity. Anything that infringes on a person’s dignity is most likely infringing on their human rights–like the right to voice opinions, to assemble, to choose our religion. Human rights are also not something that we earn. I think they’re something we should see provided for everyone. I’m not really certain how to ensure those rights for others, but I think we can take small steps to destroy prejudices in ourselves. I got stuck on breast pumps in the office.